A friend in Indiana pointed me to the books of Richard Paul Evans, who is a skilled storyteller in the inspirational genre. I hadn’t read his work before, but he’s published a lot for a guy who is only 52. 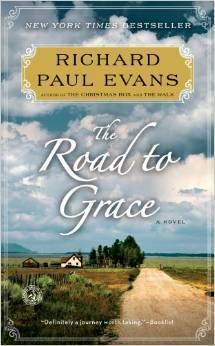 I picked up his novel The Road to Grace at the library. The title page notes that this is the third journal of The Walk series. I’m sure I’ll look for more from him. The story is about a man, a once-successful advertising executive, who has suddenly lost everything of value to him: his wife from complications following a riding accident, his business through the deceit of his business partner, and finally his home through foreclosure. He sets off on a cross-country journey on foot with nothing more than a backpack. Among the people he encounters is his mother-in-law, who follows him unrelentingly until she finally obtains his forgiveness. The Bible repeatedly defines grace as God’s unmerited favor. We can’t possibly earn it, but it is there for the mere accepting of it.